Asthma is a potentially serious medical condition which affects eight percent of women in their childbearing years. 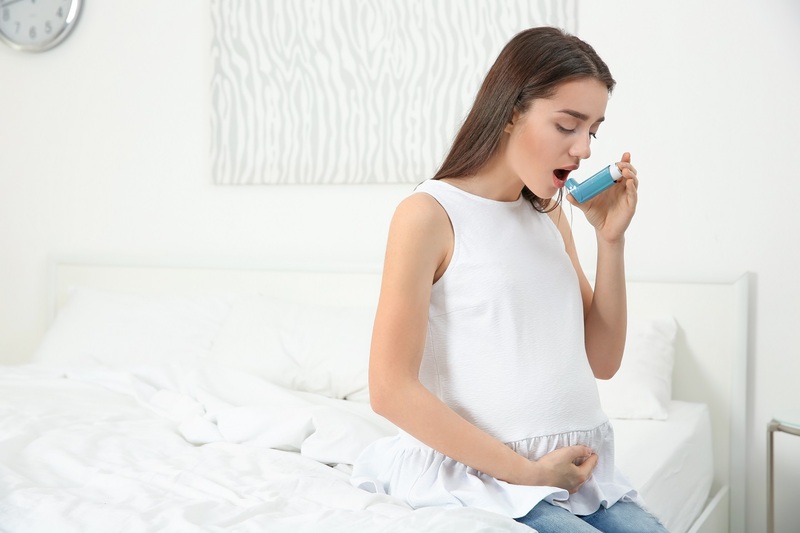 The hormonal fluctuations of pregnancy can affect the frequency and severity of asthma symptoms, with some women experiencing an improvement during pregnancy, while others have more severe symptoms. However pregnancy hormones affect asthma symptoms, the condition does not have to complicate pregnancy as long as it’s well managed. Mild or well-controlled asthma rarely results in any risk to mother or baby, but severe or uncontrolled asthma is associated with increased risks for both. Mothers with uncontrolled asthma are at as higher risk of high blood pressure, preeclampsia, and premature delivery, while babies born to mothers with uncontrolled asthma are at a higher risk of premature birth, low birth weight, a low APGAR score at birth and even stillbirth. For the one in three women whose asthma worsens during pregnancy, a new asthma management plan may be necessary. Read here about what you should consider when thinking of treatments for asthma during pregnancy. During an asthma attack inhaled irritants or allergies cause an inflammatory response in the lungs. The inflamed airways begin to swell and mucus accumulates, resulting in symptoms such as wheezing, shortness of breath, chest pain and coughing. Attacks can escalate quickly, and, if they last too long, deprive an expectant mother and her growing baby of essential oxygen. Fortunately, most common asthma medications are considered safe during pregnancy and taking them is much safer than not treating asthma at all. The safety of asthma medications is determined by collecting data since it’s not advisable to conduct studies on pregnant women. They collect data on medications that have commonly been used—such as inhaled corticosteroids—which are generally taken daily to prevent asthma attacks, and beta2-agonists, the rescue inhalers used to treat attacks. For example, Albuterol is considered to be the safest short-acting inhaled beta2-agonist since the most safety data has been collected on this short term remedy. Inhaled corticosteroids are considered preferable to corticosteroid tablets since they have less of an effect on the whole body, going straight to the lungs. Inhaled corticosteroids can also safely be used while breastfeeding, since only a small amount of the drug gets into the breastmilk. Injectable or oral corticosteroids, such as prednisone, may be required to treat severe asthma attacks during pregnancy. 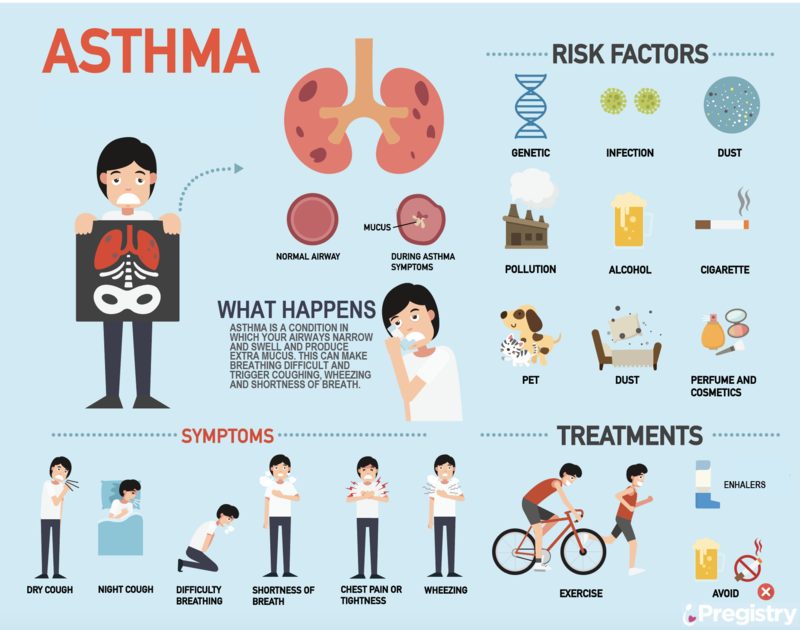 While some studies suggest a higher incidence of risk with regular use of such injected or oral steroids, the benefits of treating severe asthma usually far exceed the risk. Control allergies: About 7 out of 10 people with asthma have allergies that trigger their asthma. Such allergens include pollens, molds, animal dander, dust mites and cockroaches. If you are allergic to dust mites or mold, pregnancy is not a good time to clean out that dusty attic or moldy basement. Asthma can also be triggered by tobacco smoke or other irritants. There are many reasons not to smoke during pregnancy and tobacco smoke’s effect on asthma is another. If you have exercise-induced asthma, talk with your doctor before starting a new exercise program. Get a flu shot. Infections can trigger asthma symptoms. Prevent heartburn, which is common during pregnancy and can trigger asthma. Eat several small meals a day rather than large ones, don’t eat shortly before bedtime, and sleep with your head elevated. Talk to your doctor about whether to continue immunotherapy for allergies. Although patients sometimes continue immunotherapy, it’s not advisable to increase doses or start a course of treatment for the duration of your pregnancy. Increasing doses or starting immunotherapy during pregnancy is not advised due to the small risk of a severe allergic reaction. Get regular checkups: If you experience shortness of breath, tell your doctor. The doctor can see how well your lungs work using an office test known as spirometry, which measures the amount of air breathed in and out and the rate you breathe at. Discuss all medications—even over-the-counter antihistamines and decongestants—with your doctor. Rising levels estrogen during pregnancy can affect small blood vessels in the nose and lead to a stuffy feeling, but some studies have linked minor birth defects to certain antihistamines and decongestants. Taking your medication does not relieve symptoms quickly. Relief does not last as long as it did before. Managing your asthma can help prevent attacks during pregnancy but if breathing becomes difficult and is not managed by your medication, get help immediately. Joan Vos MacDonald has written about health and fitness for newspapers, magazines and websites. She is a member of the National Association of Science Writers and the author of two books on health-related topics, "Tobacco and Nicotine Dangers," for young adults, and "High Fit Home," a design book about fitness and architecture. She lives in upstate New York near her children and grandchildren. Antidepressants During Pregnancy: What’s Safe?